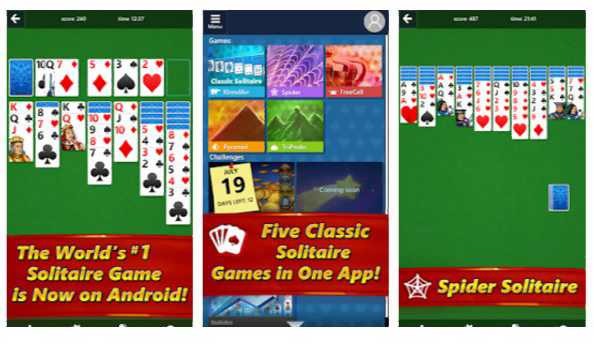 Microsoft Solitaire Collection released on iOS and Android. Microsoft Solitaire Collection on both iOS and Android version comes with Xbox Live integration. You can sign in with your Xbox Live gamertag or Microsoft account to earn Xbox Live achievements and Gamerscore, compete with friends, and continue playing on any Windows 10, iPhone, iPad, or Android device while on the go since your progress and game data are saved in the cloud. Timeless & Classic Solitaire. Clear all the cards from the table using one or three-card draw. Also try out Traditional or Vegas scoring! Eight columns of cards await you. Clear them all with fewest moves possible. Play single suit or challenge yourself with four suits! Be strategic and use the four extra cells to move cards around and try to clear all cards from the table. FreeCell rewards players who think several moves ahead. Select cards in a sequence, earn combo points, and clear as many boards as you can before you run out of deals! Combine two cards that add up to 13 to remove them from the board. Challenge yourself to reach the top of the Pyramid and clear as many boards as you can! Play new guaranteed solvable challenges in all 5 game modes with 4 levels of difficulty every day! By completing Daily Challenges, you will earn badges and rewards! Sign in with your Microsoft account to earn Xbox Live achievements and compete with your friends and family. Continue playing on any compatible Windows 10 or Android device because your progress and game data will be saved in the cloud! Microsoft is also offering one free month of Premium Edition. You can download the game from the link below.